Simplicity AI have announced that another one of their team members has successfully gained the Certified LabVIEW Architect status. This qualification awarded by National Instruments demonstrates the highest LabVIEW skill level and knowledge; proving the ability to develop a robust framework for an application. 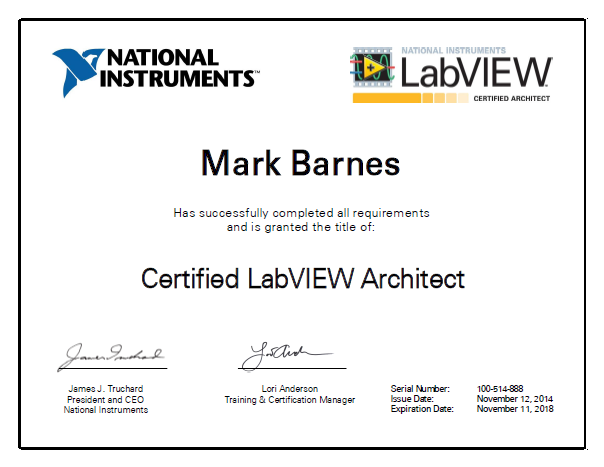 I am delighted to announce that Mark Barnes has successfully achieved the Certified LabVIEW Architect status. Our investment in training and external certifications reflects the commitment that Simplicity AI has to building up a high level of expertise in test and measurement; ensuring our customers receive the highest quality solutions. Systems Engineer Mark Barnes who recently achieved Certified LabVIEW Architect status, joined Simplicity AI in 2012. Mark previously completed an engineering internship at National Instruments and held the role of Systems Engineer at NDS. Mark graduated with a 1st class honours degree in Electronics Engineering from the University of Surrey in 2011. Mark has a wide range of engineering expertise covering areas such as hardware design, embedded software, database design and .NET development. He has a wide variety of test and measurement software experience, which is demonstrated by holding both LabVIEW and TestStand Certified Developer status.